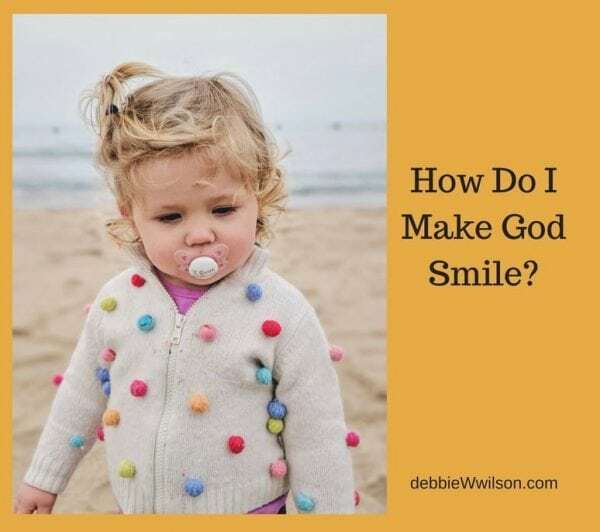 How Do I Make God Smile? I thought I was doing better with patience until a series of undesirable “coincidences” showed me otherwise. Turns out, my patience is selective. A sequence of events, like something from an old “I Love Lucy” comedy, descended on me. Only I wasn’t laughing. I handled the first ones reasonably well—at least outwardly. But when the mishaps continued the next day, I wanted to explode. In fact, I let off some steam in response to one of my beloved husband’s comments. The worst part—my well-placed zinger felt good. For the moment. After more road blocks, another wasted hour, and a half pint of Chocolate Walnut Brownie Coconut ice cream, the Holy Spirit broke through. Have you noticed how the Christian life is a God-and-me partnership? Sometimes we read verses like, “Stand still and watch the deliverance of the Lord” and think we don’t have to do anything. Everything will turn out great without any effort on our part. But a closer look shows Israel played a part in her battles. Joshua had to fight. Moses, Aaron, and Hur had to pray. We read of the Israelites praising God for their victory. They knew without God, victory would have been impossible. But God used their muscle and steel even as He sent storms and floods and supplied strength. My impatience reminded me that I can’t be patient in my flesh. And even after I asked God to fill me with His Spirit and rule my emotions and attitudes, I had a role to play. I didn’t immediately feel patient. I had to choose patience. shows us how to cooperate with the Holy Spirit so He can produce His fruit in us. But the fruit of the Spirit is love, joy, peace, patience, kindness, goodness, faithfulness, gentleness, self-control” (Gal. 5:22-23 NASB). Making God Smile contains 365 readings, one for each day of the year. The readings are divided into sections, beginning with faithfulness and ending with joy. You can choose the topic you want, start at the beginning, or skip around if you prefer. Kim connects various verses with each facet to expand our understanding. For example, she reminds us of the link between thanksgiving and joy. We can’t flip a switch and feel joy. But we can give thanks for God’s blessings. Remembering our sins have been forgiven is reason enough for joy regardless of our circumstances. Day 99 on patience spoke to me. She begins with “For the happy heart, life is a continual feast” (Pro. 31:25). She then talks about how her happy heart pumped the patience she needed on a day of setbacks. 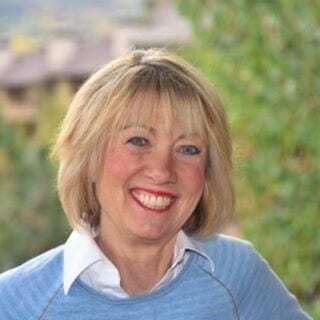 Watching her fifteen-month-old granddaughter’s unsuccessful attempt to put on her shoes and socks reminded Kim of an important truth. The girl’s parents cheered their daughter’s efforts because she tried to please them. Our Heavenly Father also smiles when we put forth an honest effort to delight Him—and He completes what we can’t. I may never perfectly practice patience. But when I try, because I want to please my Heavenly Father, He smiles and supplies the strength I lack. I was an attorney for twenty-five years, which fed my analytical nature. Since then, travel to over seventy-five countries has broadened my perspective and deepened my appreciation. My greatest joy remains family. We have three perfect grown children and five flawless grandchildren! We live in Colorado, and sometimes Oregon. I love adventures, hiking, walking, swimming, a healthy lifestyle, and, oh yes, coffee! I’ve been a regular contributor to Daily Guideposts since 2105 and contributed to several other books. I taught a Bible Study on the Fruit of the Spirit for two years, and have studied the Bible for 25 years. My hope is that my writing will make a difference in your life, that it will open your eyes and heart to God, and help you be more aware of your actions, your words, and the importance of every minute. I pray it will bring you the joy of becoming your best for His glory! You can find Kim and learn more about her book at her website. You can also find her book here. Question: Which facet of the fruit of the Spirit would you like to see improved? Thank you Debbie! It’s good to know I’m not the only one with selective patience and zingers I’ve later regretted. Thank you for sharing your experience and my book! I feel certain you’re making God Smile! Thank you, Kim! May the Lord use your book to bless many! Great question and I honestly don’t even know where to begin. Patience is probably a good place for me too and I have already noted Kim’s book so I can get it and use it as a daily devotional. That’s a big one for me, Ann. Thanks for joining the conversation. I hear you loud and clear about how my incomplete patience can show up when things start to stack up. Great post and sounds like a great book as well! Hugs to you, my friend! Melissa, I know He’s smiling as you walk with Him and bring smiles to many! This looks really wonderful, Debbie! What a greater gift than knowing God is smiling upon us! Anyone ever hear this silly joke? How can I make God smile? Great question that I’ll be thinking about for the rest of the day. LOL! Hadn’t heard that one, Yvonne. You made me smile. I love the title. And the image of God smiling. Hadn’t thought much about it before. This is a great reminder for me. I like the “God-and-me partnership” idea. Because really it is us choosing to do the next right thing. And that makes him smile. Thanks, Theresa. I see it as we can’t do His part, and He won’t do our part when He’s given us the strength to obey Him. I hate to say it makes me feel better to know I’m not alone! Thanks, Lisa. 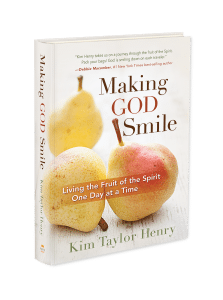 HI Debbie – Wanted to let you and your readers know that we’ve just started a Facebook group called Making God Smile to encourage each other on our journeys to live the fruit of God’s Spirit. Join and post and receive encouragement anytime at https://www.facebook.com/groups/makinggodsmile/ or just search FB for makinggodsmile. Ohhhhhhh this is right on. I def had a moment similar recently but at times it feels as if I am snowball sitting on a hill. Once I mess up it seems like myself tumbles downward more often. I guess it’s my messy emotions and I am thankful God is helping me through them–that he sticks around and doesn’t take off. And my husband lol. Thanks for sharing this. I am featuring this at #TeaAndWord. I have your books in my Amazon wish list, but this other one by your friend sounds amazing too! Meghan, thanks so much! I’ve been out of town and for the first time I don’t have a blog ready for today. So this is a real gift! Thank you Meghan! I’m hoping you’ll find it helpful!